There is a leave request form in sharepoint where employees need to apply for a leave through it. Employee's line manager comes up by automatically when employee opens the form. Of course, request is then sent line manager for approval. Sometimes line manager asks someone else to approve on their behalf, how can I do this? For this to happen I think workflow is included, where another person is added for the approval. But will it cause conflict as two their will be two approvers? 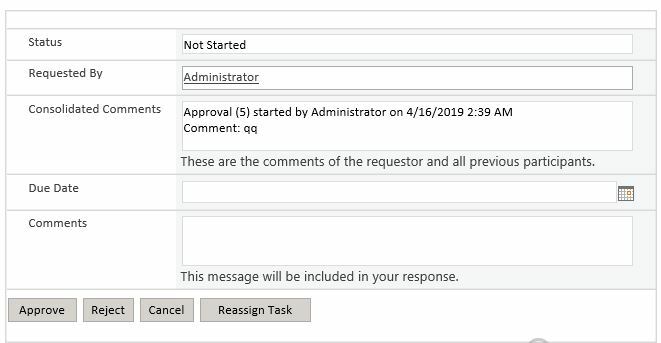 You can use SharePoint 2010 workflow platform, add "Start Approval process" action, then the approval form will have “Reassign Task” button as below, it will not conflict if there are multiple approvers in the workflow action. Not the answer you're looking for? Browse other questions tagged sharepoint-online workflow approval or ask your own question.